Charolais females met a solid demand selling to a top of 6,300gns in Welshpool on Thursday 10 November when Kevin and Sioned Thomas, Newcastle Emlyn staged a major reduction from their Moelfre herd. Sale topper at 6,300gns was Moelfre Eirlys TI +33, SRI +35, a two year old Burradon Talisman daughter, out of a Moynton bred dam and sold in calf to Gretnahouse Vigorous. The buyer was breed newcomer, Mark Swistun, Llanforlais, Gower who went on to buy two more lots including at 4,000gns Moefre Crystal TI +29, SRI +17, a Major daughter sold with her five month old heifer, Moelfre Gail by the 8,500gns Newhouse Chicago. Next at 6,200gns was the split cow and calf pair, Moelfre Aur, a six year old Killadeas Jack daughter and her eight month old bull, Moefre General by Chicago. 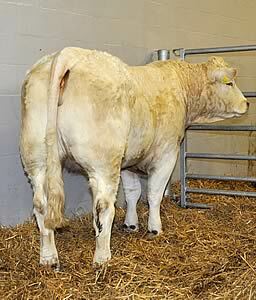 Aur went for 2,800gns to DL George and Son, Cardigan, while General made 3,400gns to CM Hughes and GT Jones, Machynlleth. At 5,500gns, Moelfre Desire TI +31, SRI +23, a three year old Greatnahouse Vigorous daughter and out of a Mowbraypark bred dam sold to AL Evans, Coedbryn, Llandyssul. She was accompanied by her five month old heifer, Moelfre Goldie by Allanfauld Norseman. Moelfre Becca TI +54, SRI +55, a five year old bred by Gretnahouse Ultimate and out of a Ffynnon bred dam, together with her bull calf, the five month old Moelfre Gladiator, by Texan made 5,200gns to JS Abel, Cwmdelan, Llanidloes. Two entries shared a 5,000gns bid. First in the ring was the split lot, Mowbraypark Starshine, a 10 year old by Brampton Chopper and her yearling bull, Moelfre Freddy TI +26, SRI +17 by Chicago. Starshine sold in calf to Chicago for 1,800gns to DG Davies and Sons, Aberaeron, while Freddy made 3,200gns to TWC Williams, Llanwrddfa, Carmarthen. The second 5,000gns call came from J McGuigan, Maghera, County Derry for Moelfre Arian TI +30, SRI +26, a six year old by Thrunton Torreador and out of a homebred dam by Allanfauld Norseman. She was offered with her Chicago sired four month old twin heifers, Moelfre Goldilocks and Moelfre Glena. Two entries shared a 4,800gns bid. First to go was Moynton Unique TI +17, SRI +20, an eight year old by Ptiprince and sold with her six month old heifer, Moelfre Gemini by Chicago. The buyer was RH Richards, Sparnongate, Redruth. The second 4,800gns call was made by CR Thomas, Dutlas, Knighton for Moelfre Fabulous, a yearling bull sired by Newhouse Chicago, and out of the Blelack Rommel daughter, Moelfre Unijet. Next at 4,600gns was the split cow and calf pair, Moelfre Undeb TI +36, SRI +31, an eight year old by Moelfre Raleigh, sold in calf to Chicago, and offered with Moefre Factual TI +37, SRI +29, a yearling bull by Chicago. Undeb went home for 2,000gns with H Morgan, Llandovery, while Factual was secured for 2,600gns by TN Lightfoot, Stoke Clinsland, Callington. Minutes earlier, another split cow and calf pair made 4,400gns. Moelfre Sirol TI +16, SRI +16, a 10 year old by Lamberhurst Volunteer went for 1,800gns to DG Davies and Sons, Aberaeron, while at 2,600gns her eight month old bull, Moelfre Gordon, by Chicago was knocked down sold to H Lloyd, Llandyssil. A further five entries sold at 4,000gns. The cow and calf pair, Moelfre Usk TI +23, SRI +27, by Blelack Rommel and offered with her three month old heifer, Moelfre Georgia by Chicago was purchased by Messrs Ewing, Dumfries. A call of 4,000gns secured Moelfre Vanessa, a Derrygiff Mills daughter and her four month old heifer, Moelfre Gemma by Chicago for DE Burrough, Salcombe Regis, Sidmouth. Next at 4,000gns was the Burradon Talisman sired four year old, Moelfre Champagne TI +15, SRI +13, and Moelfre Garfield, a six month old bull by Chicago. The pair went to join Alwyn Rees’ Pennal herd, Machynlleth. Moelfre Falcon TI+ 32, SRI +27, a yearling bull by Allanfauld Norseman and out of a homebred dam going back to Gretnahouse Vigorous made 4,000gns to WO Jones, Criccieth, while the final 4,000gns bid was made by Brailes Livestock, Upper Brailes, Banbury for Moelfre Faye TI +47, SRI +50, an 18 month old maiden by the 8,000gns Inverlochy Verne and out of a homebred dam going back to Vigorous. Averages: 21 cows and calves £4,140; 11 in calf heifers £3,131; 11 maidens £2,367; 2 bull calves £4,620.